Solar Powered Security Lights protect your home or business. These durable, bright and reliable lights can help deter unwelcome visitors and can also help to prevent dangerous trips and falls on exterior steps and stairs. They are ideal for illuminating decks, patios, walkways, driveways, and exterior steps and stairs. Solar Security lights utilize motion detection technology to automatically trigger the light to illuminate when it senses movement within a certain radius of the light. Many Solar Powered Security Light models can function not only as Security lighting but also as flood or spot lighting. They are economical and environmentally friendly. The energy of the sun is free, so they will cost you nothing to operate, lowering your electric bills, and saving you hundreds of dollars. If you are looking for a way to help protect your home and family or your business in a way which will not add to your utility bills and will not cause harm to the environment, Solar Security Lights are a great tool. 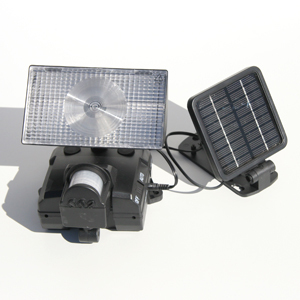 Solar security lights are durable, reliable, and bright. Use them to illuminate decks, patios and exterior stairs to help prevent dangerous trips and falls which can occur in the dark. Interested in learning more? Check out our Solar Security Lights here.